Sweet marjoram, also known as knotted marjoram, is one of the most traditional Mediterranean herbs grown for its culinary and medicinal values since ancient times. It has delicate sweet flavor, and subtle pungent (spicy) taste; comparatively gentler than oregano (Origanum vulgare). Botanically, marjoram is a member of Labiatae family, of the genus, Origanum. Its scientific name: Origanum majorana. The Labatiacea family also includes some of the commonly known herbs and spices such as dill, anise, fennel, cumin, etc. Sweet marjoram (Origanum majorana). Note for soft, oval dark green leaves. Sweet marjoram is native to Asia Minor (Turkey); however, it grows in plentiful all over the Mediterranean and southern parts of the Europe. This herbaceous plant is a small woody-stemmed shrub that grows abundantly in well-drained, lime soils. It reaches about 75 cm in height, features hairy stems with soft oval shaped dark-green leaves, and tiny pinkish-white flowers. In general, its leaves can be harvested soon after the flowering buds begin to appear. To blanch, hang harvested stems in dark, dry room for about 7-10 days, then strip leaves from the stems and store inside an airtight container. Several related species of marjoram grown either for culinary or therapeutic purposes. Pot marjoram (O. onites) has white or pink flowers. Winter marjoram (O. heracleoticum) has a strong flavor, similar to that of wild marjoram (O.vulgare). Sweet marjoram is one of very favorite herb, especially in the Mediterranean region. Ancient Greeks used it to make wreaths and garlands who firmly believed it as a symbol of peace, harmony, and happiness. The herb composes many notable phytonutrients, minerals, and vitamins that are essential for optimum health and wellness. The herb parts contain certain chemical constituents like eugenol sabinene, alpha-terpinene, cymene, terpinolene, linalool, cis-sabinene hydrate, linalyl acetate, terpinen-4-ol, and terpineol. Together, these compounds are known to work as anti-inflammatory and anti-bacterial properties. Fresh herb has high levels of vitamin-C (ascorbic acid); provide 51.4 µg or 86% of RDA per 100 g. Vitamin-C is one of the powerful natural anti-oxidant help remove harmful free radicals from the body. Ascorbic acid also has an immune booster, wound healing, and antiviral effects. Fresh marjoram herb contains exceptionally high levels of beta-carotene, vitamin-A, cryptoxanthin, lutein, and zeaxanthin. 100 g of dry marjoram leaves carry 8068 IU or 269% of DRI levels of vitamin-A. Carotenes, xanthins, and lutein are powerful flavonoid antioxidants. Together, these compounds help act as protective scavengers against oxygen-derived free radicals and reactive oxygen species (ROS) that play a role in aging, and various disease processes. Vitamin-A is known to have antioxidant properties and is essential for healthy eyesight. It is also required for maintaining healthy mucosa and skin. Consumption of natural foods rich in vitamin A and carotenes are known to help protect from lung and oral cavity cancers. Zeaxanthin, an important dietary carotenoid, is selectively absorbed into the retinal macula lutea in the eyes where it thought to provide antioxidant and protective light-filtering functions. It has proven beneficial action against age-related macular disease (ARMD), especially in the older adult population. Sweet marjoram is one of the richest herbal sources for vitamin-K. 100 g of dry leaves provides about 518% of recommended daily intake. Vitamin-K has a potential role in the bone mass building by promoting osteoblastic activity in the bones. It also has an established role in the treatment of Alzheimer's disease by limiting neuronal damage in the brain. Marjoram herb carries a good amount of minerals like iron, calcium, potassium, manganese, copper, zinc and magnesium. Potassium is an important component of cell and body fluids, which helps control heart rate and blood pressure. Manganese is used by the human body as a co-factor for the antioxidant enzyme, superoxide dismutase. Furthermore, its dry leaves are an excellent source of iron, contains 82.71 mg/100 g (about 1034% of RDA). Iron is an important co-factor for cytochrome oxidase enzyme in the cellular metabolism. Besides, being a component of hemoglobin inside the red blood cells, it determines the oxygen-carrying capacity of the blood. Sweet marjoram herb (Origanum majorana), dried leaves, Nutritive value per 100 g.
Sweet marjoram can be grown as a potherb. Both fresh, as well as shade dried leaves, can be employed in the kitchens. Fresh marjoram leaves should feature deep gray-green in color and free from yellow discoloration. Its leaves are at their best when harvested just before flowering. 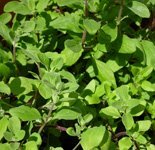 Dry marjoram leaves and seeds can also be marketed in air-seal packets or containers. Store fresh herb inside the refrigerator for extended use. Dried marjoram should be kept in a tightly sealed glass container in a cool, dark and dry place where it may keep fresh for up to six months. Wash fresh herb in cold running water or rinse for few minutes to remove any dirt or pesticide residues. Dried marjoram leaves, in fact, retain or even has a more intense flavor unlike that of other dry herbs like sage, thyme, etc. In order to keep fragrance and flavor intact, it is generally added at the last moment into cooking recipes, since prolonged cooking would result in evaporation of its essential oils. The herb gives a pleasant aromatic flavor to vegetables such as spinach, cauliflower, tomatoes, beans, peas, potato, and carrots. It complements well with many other herbs and used along with thyme, tarragon, bay leaf, and parsley to prepare "bouquet garni." Sweet marjoram is one of the main additions in sausages, pizza, and in poultry stuffing. Marjoram tea is a popular drink in the Mediterranean countries. Marjoram herb parts contain many health benefiting compounds in essential oil such as terpenes, linalool, terpineol, carvacrol, linalyl acetate, ocimene, cadinene, geranyl acetate, citral, eugenol, etc. These compounds are known to have anti-inflammatory and anti-bacterial properties. Marjoram oil has been used to treat minor ailments like flatulence, muscular pain and rheumatism. Eugenol in sweet marjoram (10% of eugenol) has been found to have an anti-inflammatory function by acting against the enzyme cyclooxygenase (COX), which mediates inflammatory cascade in the body. This enzyme-inhibiting effect of the eugenol makes it a valuable remedy for symptomatic relief in patients with inflammatory health problems like rheumatoid arthritis, osteoarthritis, and inflammatory bowel conditions. When taken in moderation, it helps relieve menstruation pain and leucorrhoea. Since it increases menstruation flow, the herb should not be taken during pregnancy and in menorrhagia conditions. Sweet marjoram tea helps relieve nausea, flatulence and is thought to have mild antiseptic functions. (Medical disclaimer). <<-Back to Herbs from Sweet-marjoram. Visit here for an impressive list of all variety of herbs with complete illustrations of their nutrition facts and health benefits. USDA National Nutrient Database. (opens in new window).